Team names top row left to right: Mike Calfin, Erik Goldberg, Jason Perry, Rob Garrett, Barry Gall, Clint Gill Todd Haig, and Bobby Hess. Bottom row left to right: Scott Samoyan, Sal Angelo, Chris Ballay, Aaron Shute and John Durkin. 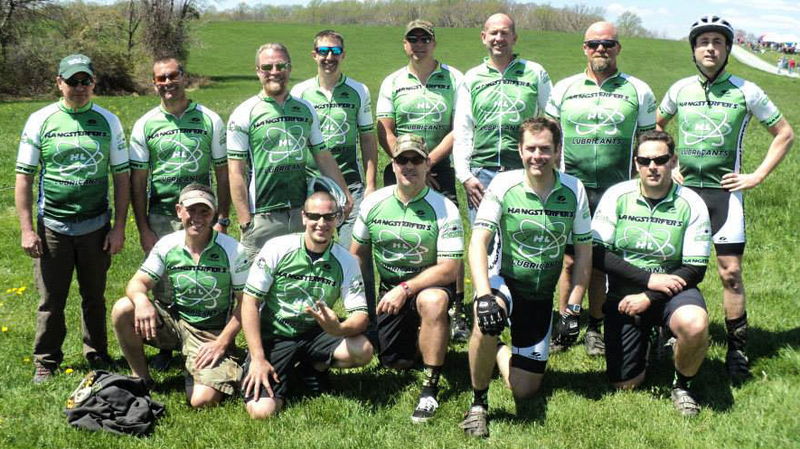 Hangsterfer’s Laboratories Plant Manager, Barry Gall, and his bike team members have found out first hand that Hangsterfer’s new bio-degradable Chain Lube is highly effective and makes a real difference! Along with supplying Chain Lube to the team to keep their bikes at top performance, Hangsterfer’s has sponsored Barry’s team. We are proud to have our colors and logo represented by an outstanding group of athletes in our local community. In the Iron Hill Challenge on May 4th in Newark, Delaware, Barry took first place. The first race of the year was held at Fair Hill in Elkton, Maryland where Barry finished 2nd and Sal finished in 3rd place in their class. The team will be racing all spring and summer in the Mid Atlantic Super Series.